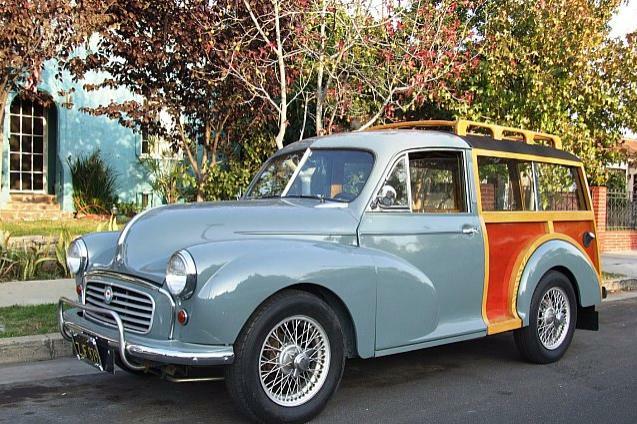 This 1956, Series II, split-windscreen Morris Traveller has been traveling around California since new. Little is known of its first thirty years in the San Francisco Bay Area, but the first time I saw it was in San Franciscan, George Kelson's driveway on 30th Avenue in the Sunset District. George found it in the SF Chronicle classifieds. The original gray paint was faded, and as usual at the time, the wood was fair except where it had rotted in the upper corners of the rear posts and at a few of the joints. In the early 1980s, Morris Minors had become somewhat collectable but not all that expensive and parts were hard to find and things like replacement wood were only a dream. The car sported a set of US "slot mags" (similar to the Wolfrace Wheels in the UK), not to look racy, but to fit available 13" tyres. Most available 14" were way too big. The other thing to consider was that Morris Minors were thought to be "cheap" classics in those days and usually "fixed up," rather than "restored". And the general restoration quality of that time was much less than what is expected today. George, who owned three Travellers and a Minor tourer at the time, treated this one to a "fix up" by getting it into dependable driving condition and going after the wood by killing the dry-rotted wood with "Get Rot", a fungicide/resin product that was popular with the wood boat crowd at the time for non-structural repairs. Once set, the black wood was beached and wood putty use d to fill the low spots. After sanding and four coats of varnish, George, a master at wood graining, would "touch up" the grain and put on another couple of coats of varnish over the repairs... There, good as new! The car was repainted a pale yellow and the alloy wheels were replaced with stock wheels and tyres. It was then put up for sale. Charles Felix was a British public relations man on his way to visit a client in Hong Kong when he decided to make a stop-over in San Francisco and take in some sightseeing on his journey. While driving along the Marin Headlands, just north of the Golden Gate Bridge, Charles made a stop at Muir Beach and felt right at home, the foggy, tree-laden seaside community seemed perfect for a proper British pub and inn. On the return trip, he purchased a large corner lot right on the coast highway. Upon his return to the UK, he found a very old pub that was to be demolished to make room for new development and had it totally disassembled, lock, stock, windows, doors and fixtures, put in containers and shipped to San Francisco. When Charles returned to the Bay Area to start building his traditional inn, he found that they were also salvaging the 70-year-old San Rafeal Hotel over the hill in Marin, so he bought all of the antique beams and much of the salvaged wood. Three years later, the Pelican Inn was opened. A brand new building that looked like it had been built 100 years before - in England. 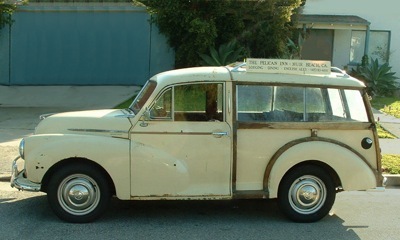 Charles filled his "art project" with all sorts of British icon artifacts; phone boxes, post boxes, and a pair old Morris Minors, a dark green 1967 Morris LCV van that had been used in London by the Customs Office and the pale yellow 1956 Traveller that he bought from George Kelson. Both served for short hop deliveries and forecourt decorations for many years and probably are pictured in many a tourist's vacation scrapbooks to this day. It is pictured in this incarnation at the left. The Traveller eventually fell victim to oldcar-itus and became too un-dependable for a catering hauler, so it was relegated to being a car park artifact, displayed near the entrance next to the Customs van. Eventually, Mr. Felix sold the Pelican Inn and the new owners disposed of the two Minors. Henri Mora of San Francisco bought the yellow wagon and made it run but did little else before it was sold again. The car then made its way 400 miles south to Los Angeles to the garage of prolific Morris restorer Randolph Williams. Randy was intrigued at the split-windscreen and solid metalwork, but knew that the rotted wood needed to be replaced. Randy started off by pulling the little wagon to a near bare unibody and stripping off the tatty ash framework. While the car came apart, he found large patches of the original gray colour and decided to respray the car to its original hue. After the metal work was completed, a full Steve Foreman wood kit was prepared for installation, but not before Randy replaced the aluminium inset panels between the ash framework and on the rear doors with marine mahogany plywood and added a custom ash slat roof like an old American woody. 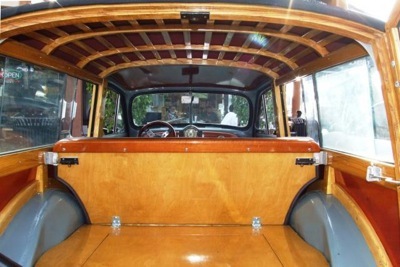 Once the wooden "doghouse" was installed, the woodwork continued with Full-length wood B post covers with walnut Dolphin inlays, and a varnished wood rear floor with a locking lid over the spare. 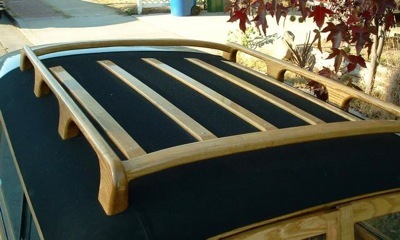 A custom wooden roof rack was installed over a German canvas covered top. 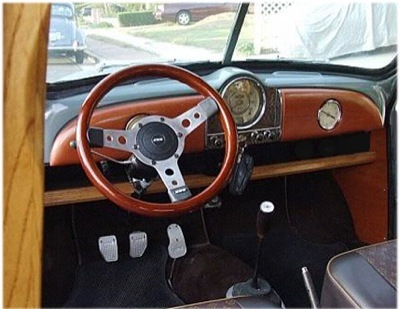 The wood theme continues inside with teak dash doors with built-in clock and Riley knobs against zebra wood trim as well as a wood steering wheel and package tray. 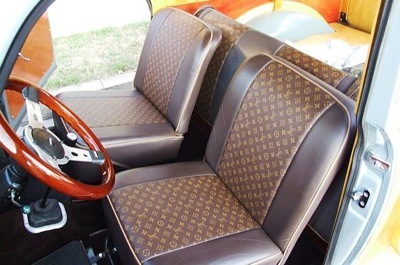 The brown leather seats feature authentic Louis Vuitton fabric insets. Under the hood rests an MG Midget 1275 engine with a Metro 1300 Manifold with HS4 Carburetor bolted to a rib-case transmission. The power train is also enhanced with Falcon Headers and tuned exhaust, and Sprite oil cooler. 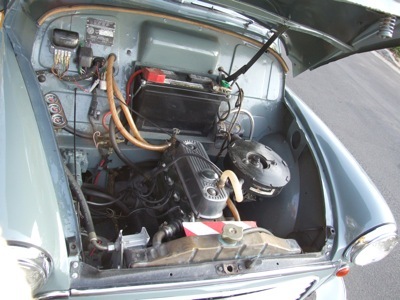 A new wiring harness upgraded to 1967 specs was installed for dependability. Highway revs are kept to a minimum by the Midget 3:90 ratio rear end. Chassis upgrades include fifteen inch, 48 spoke, MGA wire wheels, MG Midget disk brakes and a complete hydraulic make over. The suspension was modernized with new style swivel pins and an anti-sway bar. Interesting exterior details include one of Randy's custom made American Amco-style front over rider bar, a LCV bonnet flash and Mini Clubman taillights. 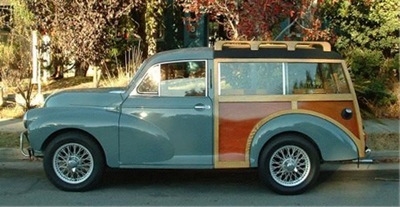 This is the most recent in a long series of custom detailed Morris Travellers that have come out of the Williams garage - the best so far because it benefited from lessons learned on earlier projects. Always a hit at Southern California car shows, there always seems to be a crowd around the car. 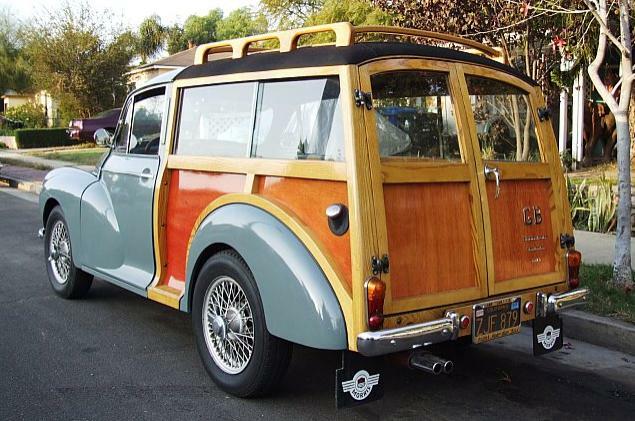 While purists might find this Minor a bit over the top, the car has been fashioned with respect to its British heritage, with a few concessions to classic American woody style, and a bit of whimsy. Comments on "Well-Traveled Traveller With a California History"